Big Brother Gossip: Feeds Over - Whose Going To Win? 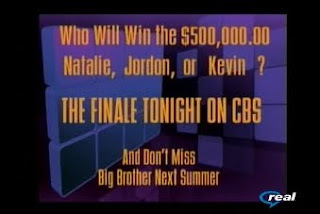 I think Jordan may take Natalie and I hope she'll beat her. If it's Kevin/Jordan I'll be happy either way. Just as long as Natlie doesn't win. I'd prefer she not make the final 2 at all. I really think Jordan will win if she makes it to final 2. She will have Jeff, michele and americas vote all she needs is 1 more.